According to statistics in this PDF published by the National Center for Health Statistics (NCHS), 15.6 million children and adolescents, aged 5 to 17, missed one or two days of school in 2012 because of illness or injury; another 12.7 million students of the same age group missed 3-5 days. As children spend most of their waking hours in school, school nurses are on the front lines in the battle to keep children healthy. They are in charge of creating age appropriate programming to encourage students to make healthy choices in all aspects of their lives, from exercise and eating right to being aware of how they can get sick. School nurses also administer basic first aid and, with parental permission, can treat mild fevers or headaches with the use of over the counter medicines. Health education: Not to be confused with teaching a health class that meets curriculum requirements, school nurses conduct health-related educational campaigns for parents, faculty and students that discuss how colds spread or the most current illnesses affecting their students. Wellness: K12 nurses often work with faculty and staff to encourage and ensure healthy learning environment by providing adults with resources on how to keep themselves healthy and set good examples. Counseling: Nurses are often one of the first staff members to recognize that a student may need mental health services. Counseling, interventions and referrals to mental health resources are commonly provided. Nutritional services: School nurses can play an integral role in the development of a school’s lunch program. They also often maintain and file a list of your students’ allergens. Community involvement: School nurses work toward a healthy school by serving as a liaison to local health advisory committees and to parents. Physical education: Nurses may also work with a school’s athletic department to develop a healthy PE program for students. Click the image to view the companion guide! Note: Opens in PDF. Our accompanying guide was created to be used alongside the information provided here. It is easy to print, and we have made it possible for you to choose which pages are most relevant to your needs. You can find the entire companion guide by clicking here or the above image, (opens in PDF) or continue through this guide to learn about the most common health concerns facing our school-aged children. Feel free to share our resource and visual guide on social media, download and print or refer to our guides the next time you have a health concern. If you’d like to obtain a higher quality PDF or would like to see more of our resources in the future, please contact us at education@rntobsn.org. School nurses are no strangers to the pathogen-laden environment supporting the spread of illness in schools. Shared spaces, air and supplies make the transmission of germs from one student to another easier and more likely to occur. 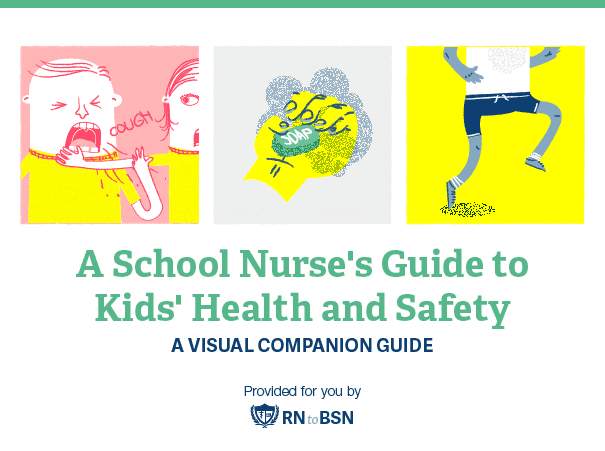 A basic understanding of common illnesses, their symptoms, treatments and how they’re spread is essential for parents to help nurses and teachers keep kids healthy at school. Source: Centers for Disease Control and Prevention; designed by RNtoBSN.org. 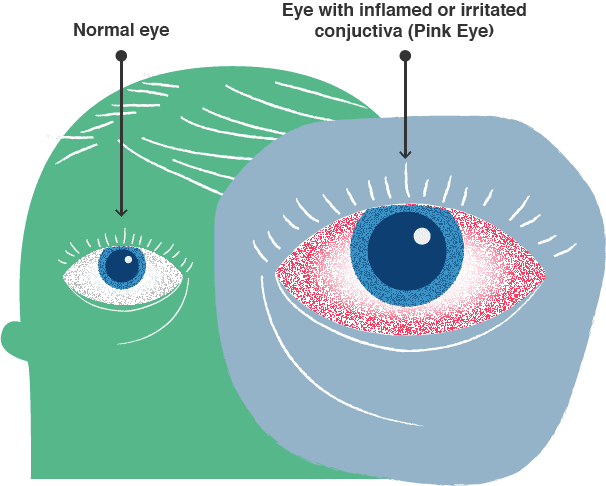 Widely known as “pink eye” because of the pink or red coloring that accompanies this infection, conjunctivitis is the inflammation of the membrane that covers the eye and eyelid. The condition is highly contagious and common among children. Viral Pink Eye: This type of conjunctivitis often accompanies a cold or sinus infection, and both eyes can be affected. Discharge for this type is often more watery. It clears up on its own in one to two weeks, though using artificial tears and cold compresses will help alleviate much of the dryness and swelling. Bacterial Pink Eye: This conjunctivitis can occur when a child has an earache or other upper respiratory infection. It is accompanied by thick discharge, and only one eye will be infected. Once on the prescribed medication, the condition will clear up in a couple of days. Using eye drops and cold compresses will help ease some of the symptoms. Allergic Pink Eye: Conjunctivitis triggered by allergies usually occur seasonally, with high pollen counts. Children with hay fever, asthma or allergies to animal dander or pollen may become infected in both eyes. Allergy treatment and the removal of the environmental irritant will alleviate the symptoms. Most pink eye cases clear up on their own, but if your child experiences any of the following symptoms, take them to their doctor to ensure there aren’t any deeper issues or concerns. Regardless of the origin of pink eye, most schools and daycare facilities have specific policies for students who are infected. 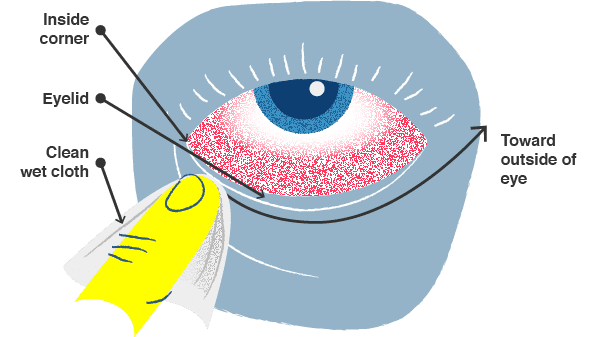 Parents are generally asked to keep children with any sort of conjunctivitis at home until the eye is no longer tearing or producing discharge. Most children spend three to seven days at home. Some schools also require a doctor’s note. Talk to your child’s school nurse for their policy on how long a child with pink eye should remain at home. Preventing the spread of pink eye is as simple as washing your hands and not touching your face or eyes. Disinfect all surfaces in your home that the infected child has come into contact with, and clearly label which eyedrops are for them. Sore throats in childhood are common occurrences. Strep throat, on the other hand, is a more serious infection caused by group A streptococcus bacteria. It is very contagious and can be contracted through coughing, sneezing or sharing a glass with someone who’s already sick. Source: WebMD; designed by RNtoBSN.org. 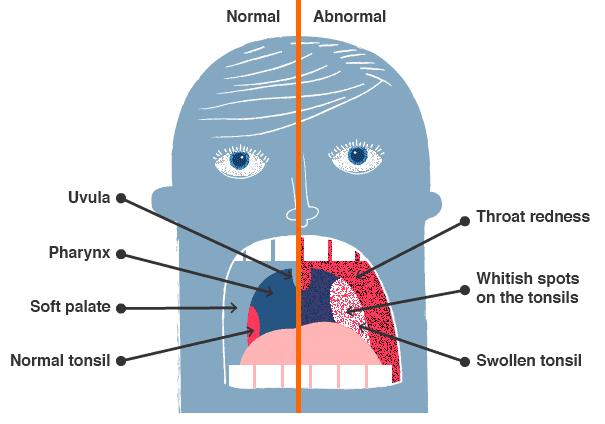 While it’s important to understand what to look out for when judging the throat’s condition, it’s difficult to determine with authority whether your child is suffering from a sore throat or strep by simply looking into the throat, so you should see a doctor for a strep test. It is important to follow your doctor’s instructions for the antibiotic regimen. Strep throat is contagious until children have been treated with antibiotics for 24 hours. Avoid the spread of strep by quarantining your child for this short period. The strep bacteria lives on surfaces, like the bristles of a toothbrush; prevention measures include cleanliness and replacement of toothbrushes to prevent reinfection. Talk to your child’s school nurse to learn about the school’s policy for when they can return to school after having strep throat. Source: San Diego Unified School District; designed by RNtoBSN.org. Head lice isn’t dangerous, but it breeds rapidly and quickly forms scalp infestations which cannot be ignored. Lice reproduce mostly in human hair follicles and feed on human blood. 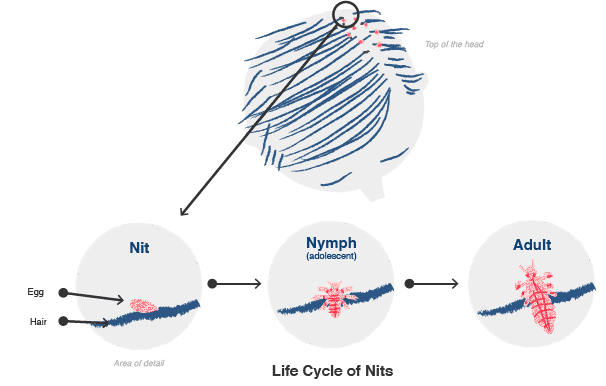 Eggs, or nits, are attached to hairs near the scalp, where the adolescent (nymphs) and adult lice live. Question: How did my kid get lice? Answer: Lice is transferred from head-to-head contact. 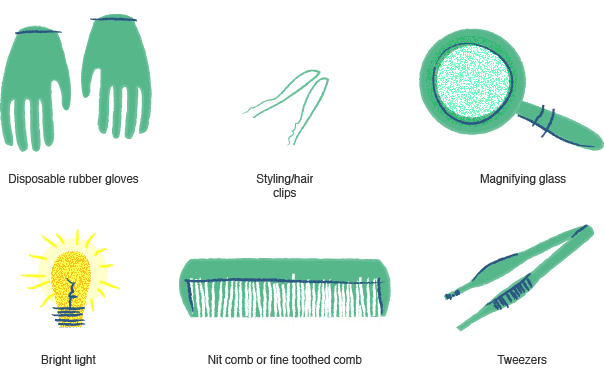 This can occur while a child is near another child with lice or through the sharing of: hats, brushes/combs, scarves or ponytail holders. Avoid pillows, beds, couches or related objects if someone with lice has used them. Lice don’t live long without human hosts, so any on the floor will be dead in a few hours or a day. Question: What are the signs of lice? Answer: A child may report feeling something moving on their head, excessive itching, irritability or have difficulty sleeping (lice are most active at night). Question: How do I find lice on my child, and what am I looking for? 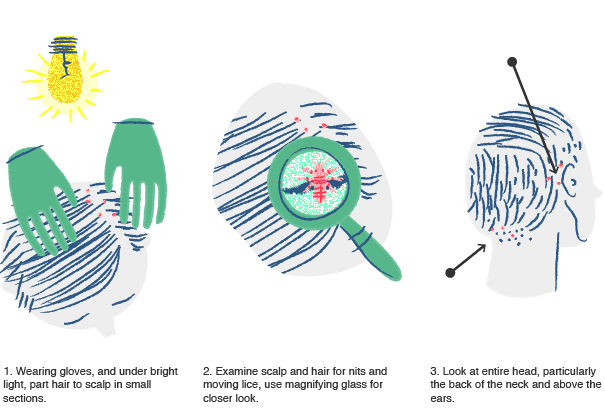 Answer: Using a magnifying glass, fine-toothed comb (nit combs often come with medication) and bright or natural lighting, inspect the strands of your child’s hair close to the scalp and roots. Look for white dots that indicate lice eggs and live lice are present. Question: How do I rid my child of lice? Answer: The CDC recommends the use of lice medication before using a delousing shampoo. Shampoos should only be used as a second-line treatment. There are some home remedies, such as using olive oil, which can slow down lice in order to comb them out of the hair. Question: How do I rid lice from my home? Answer: To prevent re-infestation, you need to thoroughly clean your home. Wash any fabric item the child has contacted for the prior 48 hours in hot water and dry on high heat. Seal non-washable items in airtight plastic bags for at least two weeks. All hair care implements should be washed in hot, soapy water. All upholstery must be thoroughly vacuumed every day until you’re sure you are rid of lice; this includes fabric-covered furniture. If lice are on your child, lice are in your home; examine everyone in your family who has come into contact with the infected child. 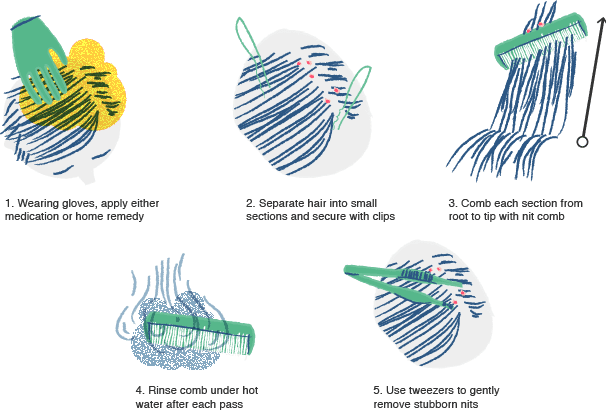 Without a host’s body heat and blood, lice only survive for a day; however, their sheer numbers mean it is likely one is lying in wait for an unsuspecting sibling or classmate. This extremely contagious virus runs a course of five to ten days, though your child may have contracted the disease as much as three weeks before any symptoms appear. At first, it may seem like your child has a cold as a high fever, headache, loss of appetite and tiredness appear. Within two days, chickenpox’s trademark itchy rash develops. Raised red bumps appear on the skin over the course of a few days, after which they form fluid-filled blisters. These blisters break open about a week later and form scabs that take several days to heal. Children with chickenpox are still contagious until all blisters have formed scabs. Most schools allow children to return at this stage, but you should talk to the school’s nurse to determine their policy. If you suspect your child has been exposed, exercise caution around those with weakened immune systems. Prevention is easily managed via a two-stage vaccine. Families who do not opt to vaccinate should be aware that the virus is airborne and can be spread by coughing or sneezing; it may also be spread by touch. It is possible to contract the virus from child who has not yet developed the rash. Unfortunately, chickenpox has to be allowed to run its course, but there are ways to relieve itchiness and reduce fever to make the virus a little less uncomfortable. The CDC recommends using a non-aspirin pain reliever to bring down your child’s temperature. Colloidal oatmeal baths or calamine lotions reduce the itch that comes with the rash and healing scabs. Blister-like, pus-filled spots may be confused for chickenpox, but if your child doesn’t have a fever, and the skin around the boil is red and warm or hot to the touch, it may be a different illness altogether. Methicillin-Resistant Staphylococcus Aureus (MRSA) is a bacteria that has evolved in recent decades in response to the overuse of antibiotics to treat infection. Once purely a hospital-acquired infection, MRSA is increasingly considered a public health nuisance. The newer form of MRSA is community-associated, meaning these antibiotic-resistant skin infections are being spread via contact outside of a healthcare setting. Usually, MRSA enters the body through a cut or scrape of some kind. The skin around the break becomes red and inflamed, sometimes in the form of an abscess which is often swollen, painful, warm to touch and full of pus. These boils are commonly found (opens in PDF) on the legs, buttocks, back of neck or groin area of those infected. This infection has the potential to morph into a serious illness or recurrent infections, especially in children. Students with apparent skin infections should be monitored closely, so let your school nurse know of any issues. It is important to see a doctor for MRSA; they know how to drain the infected area without causing new infection and may prescribe an antibiotic. All prescribed medication must be taken, even if the wounds seem to be healing. Proper hygiene is the best line of defense against MRSA; good handwashing technique and regular bathing reduces the bacteria living on the skin. Make sure all clothing, bedding and towels that come into contact with an infection are thoroughly washed and dried to prevent spreading. Any skin wounds should be bandaged, and special care should be taken around people who have active MRSA infections. Do not share linens, clothing or other personal items with infected family members, and disinfect all surfaces. It can be tricky to distinguish a cold from the flu, particularly in the beginning stages. Both illnesses are likely to begin with a sore throat, followed by nasal congestion, body aches, cough and a general feeling of unwellness. 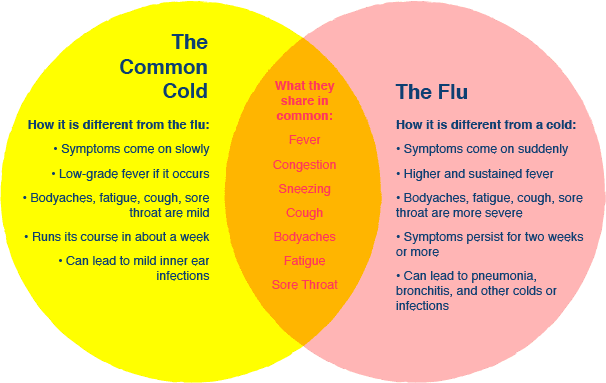 Though similar, these symptoms with the flu are often more serious than those that accompany a cold. Source: National Institute of Allergy and Infectious Diseases; designed by RNtoBSN.org. Body aches are more severe with the flu. 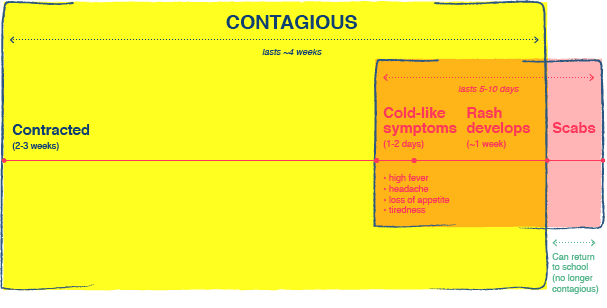 Fever is a good clinical indicator of cold versus the flu; colds rarely cause a fever over 101 degrees, but the flu can result in a much higher, sustained fever. Colds run their course in about a week, but the flu symptoms can persist for two weeks or more. Both the flu and a common cold can be prevented by practicing good handwashing and keeping surfaces disinfected to stop the spread of germs. Also avoid touching your face during flu season. Families should consider an annual flu vaccine, available every year in the fall, to lower the risk of getting the flu. Over-the-counter decongestants, pain relievers and fever reducers treat uncomfortable symptoms in both a cold and the flu, though caution should be exercised in young children, and all dosage instructions should be followed completely. If you’re unsure how much you should give your child, talk to your doctor. For most cases of a common cold or the flu, lots of rest and plenty of fluids are the most common remedies. In severe cases of the flu, antiviral medications may be prescribed. Creating a cleanliness routine and good hygiene practices at home will help stop the spread of germs elsewhere. Sit down with your family to review the basics. 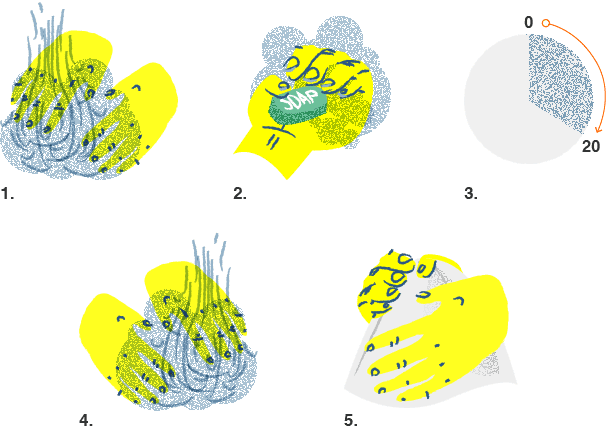 The Centers for Disease Control (CDC) recommends a five-step procedure for the most effective handwashing technique. The importance of handwashing after using the restroom cannot be overstated. Germs are lurking on the toilet flusher, the door knob and even the sink faucet. In situations where handwashing is not possible, hand sanitizer is a better replacement than not washing at all. Most alcohol-based hand sanitizers remove 99.9% of germs. Aside from handwashing, children and adults should also exercise proper etiquette when coughing, sneezing or wiping and blowing your nose. Cover your mouth and nose completely. Cough or sneeze into your shirt! Use your arm or elbow if you need! If there is no tissue available, direct the force of your cough or sneeze into the crook of your arm and follow up with handwashing or use of hand sanitizer. Following these rules not only cuts down on the transmission of colds and flu but also more serious illnesses. More than how we respond to illnesses, the building blocks of maintaining good health include eating right and the getting proper amounts of exercise. When children and adolescents learn to treat their bodies well, it can translate to healthier habits in adulthood. Children and adolescents who regularly exercise are stronger and less likely to be overweight. They are also less likely to develop Type 2 diabetes or high blood pressure that can result in strokes. Any exercise is better than none, but the National Institutes of Health (NIH) specifically recommends children exercise for at least an hour each day. While that may sound intimidating to parents, there are many ways to incorporate exercise into an average day. Endurance, which leads to a strengthened cardiovascular system, results from aerobic exercise. Not all aerobic exercise needs to happen in a gym; families can build endurance when sharing in activities like bicycling, ice skating, swimming or walking. Many adults think of weight-lifting as the best way to build muscle strength; while this is true, it’s not the only way. Children can build strength through active play that tones and strengthens muscles naturally, like climbing playground structures or wrestling. Similarly, children develop flexibility when they turn cartwheels, dance or stretch before a neighborhood basketball game. Moderate Intensity: These activities get your child’s blood pumping. Their pulses are up, and they’re burning between 3.5 and 7 calories per minute. In general, this type of aerobic exercise causes you to breathe heavily, but you are still able to talk. Vigorous Intensity: These activities also raise your child’s heart rate, but they burn 7+ calories per minute. With this type of activity, holding a conversation is more difficult as more of your breath is being to provide oxygen to your blood. Though some might not think, “Oh, I’ll work out my bones today,” any activity that creates tension on the bones works to increase strength and promote healthy bone growth. This includes any activities that build and improve muscle strength and tone. In order to determine if your child’s aerobic activities are working to burn those calories and get their hearts pumping fast, you will need to do some math. Or use the use chart below where we’ve done the math for you! Any activity is better than simply sitting around the house all day, but reaching the recommended beats per minute during aerobic exercise ensures that children and adolescents are doing good things for their bodies. Good nutrition is a critical part of good health, and it’s never too early to start teaching children how to properly nourish their bodies. Parents have an enormous influence on a child’s attitude about eating and nutrition, and they are in a position to promote the lifetime adoption of good eating habits. By exercising portion control and making healthy choices, like avoiding sugar, you bolster healthy eating habits. Offering children a wide selection of healthy options and encouraging experimentation also leads to better health. The beverage cup indicates a sufficient daily intake of dairy products. In its departure from the pyramid, the USDA now recommends we eat more fruits and vegetables than grains or proteins and a smaller fraction of dairy products. A healthy diet does not require you to follow USDA guidelines to the letter. Children and adults can enjoy sweet and savory snacks; there is no need to eliminate them. As with all consumption, moderation is key; when eating treats, be mindful of balancing them with healthier options (opens in PDF). 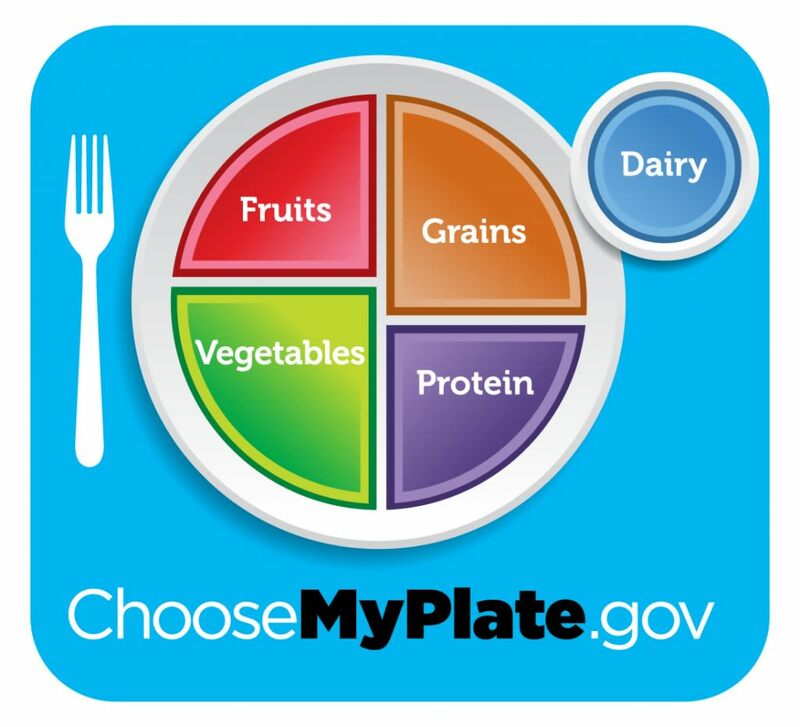 The USDA uses the same criteria found on MyPlate to develop healthier school lunch programs. As of the beginning of the 2014-15 school year, all school lunch programs, and the snacks made available by the schools, have to meet nutrition standards as laid down by the Healthy, Hunger-Free Kids Act 2010. 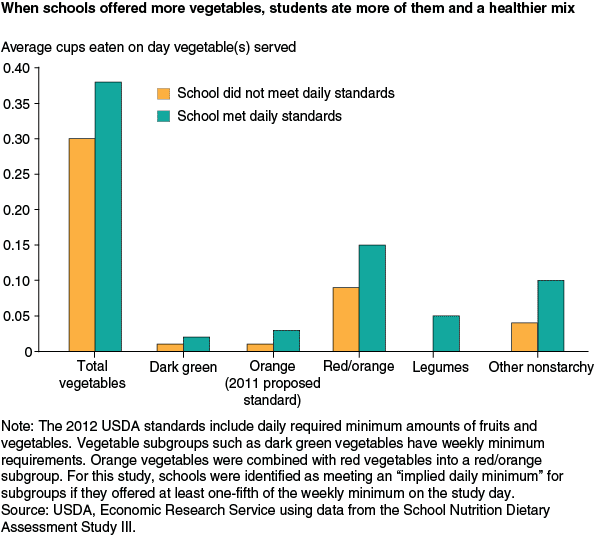 The standards also suggest that the lunches provide age-appropriate portion sizes. Some schools offer healthy vending machines as an alternative to school lunches, with the machines featuring fruit, vegetables, bottled water or low-fat protein bars. Packing a lunch provides students with a level of flexibility that may be harder to pull off with school lunches; students are able to bring in foods they like, while having more control over food portions and nutrients. Students who have special dietary needs, like some athletes who need to take in lots of calories when in-season or children who can’t eat gluten (see more about managing food allergies in school), can also pack foods that help them get through the day. Talking about healthy eating and demonstrating how to make a well-balanced lunch is the first step to developing lifelong healthy eating habits. One of the best ways to keep children and adolescents motivated is to find a way to show them that their efforts are paying off. Our bodies, through healthy eating and regular exercise, change slowly, so providing kids with a way to monitor their progress and track their successes may keep them from feeling discouraged. Daily activities can be tracked in diaries or journals. Write down daily physical activities, the amount of time spent exercising and the food eaten from each food group. The following are online resources, trackers and applications that children and adolescents can use to set and reach their health goals. RNtoBSN.org Companion Nutrition Tracking Chart: (Opens in PDF) We created this easy-to-use table to help children, adolescents and parents keep track of whether they are getting the recommended daily servings for the main food groups. The printable table has room for a week’s worth of meals: breakfast, lunch and dinner. Children can write what they eat at each meal, how much and total their serving sizes at the end of the day. RNtoBSN.org Companion Exercise Tracking Chart: (Opens in PDF) To help K12 students monitor their daily physical activities, we made an exercise chart where they can set a goal for the week then list what they do to get their heart pumping and blood flowing. Each day has space for students to write their activities, how long they spent playing, running or dancing, and the total for the day. Presidential Active Lifestyle Award (PALA): For children, adolescents and adults, PALA offers a challenge for those who want to lead healthier lives through eating right and regular physical activity. Once you’ve created an account, it’s easy to track your progress online and reach personal goals. Nutrition and Healthy Eating: Designed for preschool and kindergarten students, this app for the iOS teaches children about healthy food choices through easy to use games. Awesome Eats: Available on Android and iOS devices, this app is geared toward an older audience. Through sorting games, your children learn how to balance their nutritional choices. Eat-and-Move-O-Matic: This iOS app teaches older students about the foods they eat, what kind of energy they get from the food and what level of physical activities they need to do to work off the calories. Nicolas’ Garden: For children and adolescents, this app provides an interactive element to making healthy food choices that makes shopping for and preparing the food more fun. It’s available on Android and iOS devices. FigureFacts Teens: This app, built for Apple products, makes it easy for teens to track their daily food consumption to ensure they are eating the recommended servings of each section of the food pyramid. Between 2009 and 2011, 5.1% of children between zero and 17 were reported to have some sort of food-related allergy; an increasing trend since 1997. Though the percentage may seem small, it is important because allergic reactions can be life-threatening. School nurses are trained to properly assess and react to students’ food allergies. Ideally, your child will have been seen by an allergist to assess current allergies and to develop an allergy reaction plan. If your child has food allergies, it is critical to communicate this and any reaction plans to the school nurse. Parents are encouraged to request a meeting with school administrators to ensure all adults interacting with your child are aware of your child’s allergy. School nurses, teachers and parents can work together to create a safe learning environment for the food-allergic child. It is helpful to understand each child’s particular verbal description of a reaction, such as “My mouth is burning,” or “My chest feels funny.” Communicating to an adult can be difficult for a frightened child in the midst of a reaction, and parents should make the school’s staff aware of each child’s description of symptoms. Anaphylaxis, an extreme reaction to an allergen, is serious business. When a reaction is triggered, symptoms can rapidly affect multiple areas of the body at once. In the worst cases, blood circulation and breathing are compromised. Allergies that can result in anaphylaxis qualify a child for special services under a 504 Plan. This section of the Americans with Disabilities Act of 1973 (ADA) requires parents, healthcare professionals and school faculty to establish a written plan of action should your child be exposed to the allergen in question. 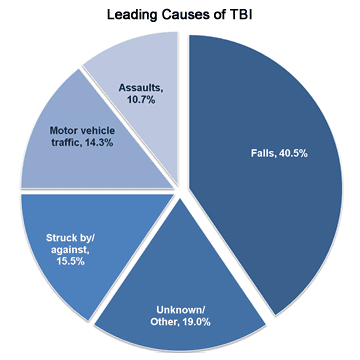 It goes without saying that activities that could inhibit a healthy brain recovery or inflict additional trauma must be avoided: secondary TBI, defined as a new concussion sustained before the brain has fully healed from an old one, can result in permanent brain damage. 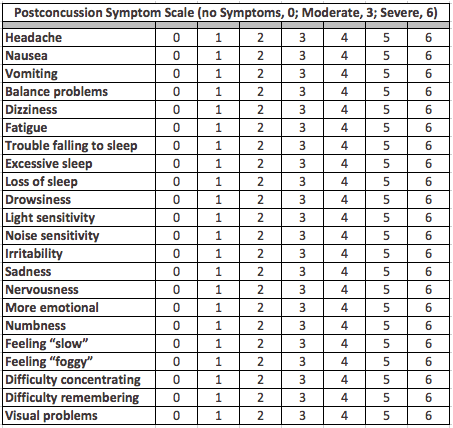 Recognition and education are paramount, because although proper equipment, sport technique, and adherence to rules of the sport may decrease the incidence or severity of concussions, nothing has been shown to prevent them. Click to open the above PDF and print this survey form today. While monitoring symptoms and being vigilant is important, they do not replace a doctor’s opinion. Thanks to increased awareness of the frequency of TBIs in children, school districts have responded to this public health threat by developing policies for the management of concussions. The timeline for healing is unique to each child, so parents should monitor and keep the school nurse and teachers informed of their student’s progress. As recovery commences, the child’s return to the classroom should be gradual; expectations should be managed accordingly. Don’t forget to check out our visual companion guide! Click image to view. Note: Opens in PDF.